Scoop, stir, and serve rice with this handy 9" bamboo rice paddle! Compared to a standard serving spoon, this versatile product is designed for easier handling of rice and easier scooping from rice cookers and warmers. The bamboo material can also be used for stir fry cooking and mixing vinegar into rice for sushi. Also called "Shamoji," rice paddles make an excellent addition to Asian restaurants, buffets, and catered events where rice is served. Considering the price paid for it, it's a good buy. It's solid, edges are finished to prevent splintering. Does stain a bit, but that's just the nature of the medium. Very sturdy, strong bamboo paddle. It’s the perfect shape and size for fluffing and serving rice. Since it’s bamboo and not waxed, it can even be composted if it ever breaks or wears out, which is perfect for my garden. I think plastic rice paddles are easier to clean, but bamboo just looks so much nicer. It's worth the slightly increased price. This is good quality bamboo that's fairly simple to clean and hasn't been stained so far, even though I cook black rice often. Definitely worth purchasing if you own a rice cooker. This is a nice product. I prefer this paddle over a plastic one. The wood feels nice in your hand, and looks better if used for service. Not dishwasher safe. Great rice paddle perfect compliment for any rice cooker if you lose the one includes this its the perfect substitution, great wood original item, perfect paddle !! This was very rough and actually gave a splinter. I had to sand it down with fine grit sand paper, and oil it with mineral oil and it is great now. Thank you for your feedback! We’re sorry this did not meet your expectations. For recommendations, please contact our Customer Solutions team. All natural love it. Small paddle but definitely large enough for serving rice in portion sizes. Good product. The rice barely sticks to the paddle too! This 9" bamboo rice spoon is good quality wood, and it's good size for serving rice, and I love it coz it's not mealt like plastic rice spoon . And it's great price and shipping was fast. Big fan of this bamboo rice paddle. It has a simple, effective design – perfect for serving and stirring rice. Since it's wooden, there's no need to worry about it scratching your pots and pans. This nine inch, Town brand rice paddle is made from Bamboo, so it prevents unnecessary scratches on surfaces. Of one-piece construction, this is great to use for commercial kitchens as it stirs, scoops, and serves. This Bamboo rice paddle is a nice size but mine did have a splinter that I had to pull off of it. The paddle is flat with no curve to it. this is a basic bamboo rice paddle. it is sturdy, feels good in the hand, and works well. The cost is mild and the only real downside is that, being wooden, cleaning and sterilization are more difficult. Ordered these to use for serving salad and they were great. Unfortunately, they stain somewhat from the balsamic vinegar, but they're not intended to hold up to vinegar, so all around 5 stars. This rice paddle works great. It is nice and flat without a rounded bowl so you can scoop up a large amount of rice and dish it up easily. It is quite smooth and comfortable to hold as well. We highly prefer using a rice paddle instead of a spoon. The paddle allows you to easily scoop rice out of a bowl or a rice cooker. This is a very inexpensive product that you will use every time you make rice. Asian culture loves these products and so will you. This is something I didn't think i would ever need. But for whatever reason using this to scoop rice is much more efficient that any old spoon. I really needed this for making sushi and matting the rice down on the bamboo roller. This works perfectly just as I needed it too. Only downside is the rice sticks but not a big deal. This bamboo rice paddle is great. The handle is short so it is easy to use even in deep pots. The large scoop end picks up a large amount in one try. LOVE this rice paddle. I don't actually even use it for rice. It's great to use for mixing up heavy-weight ingredients with lighter weight ingredients. For instance, I use it to mix all my slaws and my quinoa and/or rice salads with their dressings and vegetables. It doesn't tear up any of the ingredients and gets these types of items mixed well, quickly. Can't live without this little guy. This is a very nice bamboo rice paddle. It's good quality and gets the job done nicely. I do not have any complaints and I would recommend. Very good quality bamboo paddle. It can scoop out large portions of rice and also works great for stirring sauces. It won't scratch your pots and pans. I would recommend. Large scoop part makes it easy to dish out rice with this or use it to spoon it into a container! It doesn't scrape or scratch pans and works well for stirring sauces without adding a bad metalic taste like some metal spoons will. This spoon has a different function, and it's shape is unique I'm relatively new to bamboo paddles and spoons, and I'm regretting not trying them sooner! Lovely products, would recommend! This paddle is not fancy but exactly as described. At a great price, I wish I would have ordered another one or two just to keep on hand. Great efficiency paddle that is study and holds up well to use. We use this exclusively for rice and while some grains stick to the paddle it is much more study and allows for faster scooping. Our samples did have some splinters on the handle which I removed quickly with sandpaper. This bamboo paddle is great! I use this for spooning out rice. Even though it's meant for rice, I occasionally use it for mixing my sauces. This paddle has so many uses so there's no way you can go wrong by purchasing this bamboo paddle. These are very good for stirring food and sauces also. It being made of bamboo is another huge plus as it does not damage cookware and is eco friendly. A great and simple rice paddle. Great for tossing, fluffing, and scooping rice. The bamboo gives it a light but sturdy feel in the hands. I honestly wasn't sure what to do with this we it came. I had to do some research on why my husband thought we needed one. Turns out it is one item we use a lot. So hats off to my husband for purchasing it. this thing is really made of bamboo it really works and is very sturdy i don't think it will ever break another great product from web restraunt! This 9" wooden bamboo spooon has a very wide surface. That it is very easy to scoop out a great amount of rice every time. The price is a giveaway. Never been a huge fan of the wooden or bamboo paddles. I wanted to try rhis one, because I like having a bigger paddle for bigger projects like making sushi rice for spam musubi, for 400 people. Just nice to move morw rice once. This works well for that purpose. I gave it therw stars because the surface is not smooth. It has fibers that catch onto thigs. It grabs onto the sponge or rag when cleaning, if you go against the grain. Then little fibers can be seen clinging to the paddle. This may just be a problem with this one paddle, I cannot say. Awesome little rice paddle that works great for scooping up rice and a whole lot of other cooking applications. I prefer these over the plastic ones. We love this Town 9-inch bamboo rice paddle. It's thicker than the standard rice paddles that come with rice cookers so this one is much sturdier. And we try to avoid using plastic on hot foods so this one is perfect. No more metal on metal with these rice paddles. I really love them. There are great quality and the bamboo is especially very strong and waste well. I was surprised at just hiw strong this paddle is. It is strong enough to easily use fir a number of things that require a sturdy utensil. 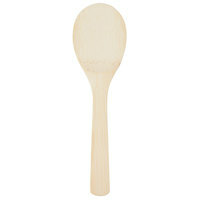 This is a nice size bamboo rice paddle that I can use to scoop rice out of the rice cooker and to serve similar foods. This works Great when you're making lots of rice or you have a rice cooker. It helps stir the rice around and it's a great scoop as well! The word isn't too bad either. This rice paddle is awesome. I use it to serve more than just rice. It works great every time. It comes at a great price and worth a try. I use these for stiring caramel and other sugar melting projects in a stainless steel pan. They can take the heat and clean up very nicely in the dishwasher. This is a great rice paddle and a great value. It's short enough that it fits well in your hand and provides plenty of leverage while being long enough to keep your wrist out of the rice. The bamboo also makes it less prone to rice sticking to it. A must-have if you own a rice cooker. Metal utensils can damage the non-stick surface, so wood or plastic is the best option. This looks nice and is holding up so far. Bamboo rice paddle that does tremendous wonders for non-stick pans and is small enough to get crevices of pots. It does not scrape the coating of our pots / pans and has a fat enough head that it covers a lot of ground. Very nice!